I’m a big fan of Myra Kornfeld. I’ve had the pleasure of taking two cooking classes with her, and I have all three of her cookbooks. I always recommend her books to new cooks: her recipes are very clearly written, approachable, creative and delicious. She draws inspiration from all regions of the world, and I find that her measurements are spot on — especially for people who aren’t yet comfortable experimenting too much with seasonings. My clients love this Moroccan-inspired dish, consisting of breaded chicken breasts stuffed with dried fruit, onions and nuts. Normally, I opt for the more flavorful and moist legs and thighs when eating chicken; but the stuffing in this dish imparts lots of flavor and moisture to what can be a boring cut of poultry. I know this recipe is lengthy, but it doesn’t actually take too long to make. Plus, since it reheats so well, it’s a good dish to make a day ahead if you’re planning a dinner party. Your guests will surely be impressed. *I used unsweetened tart cherries, which are very tart. You may prefer dried Bing cherries for a sweeter flavor. **I used sucanat, which is unrefined, evaporated cane juice. You can use whatever kind of sugar you like. ***My preferred fats for sautéing are olive oil, coconut oil, or ghee. Warm the oil in a medium skillet over medium heat. Add the onions and sauté until tender, about 6 minutes. 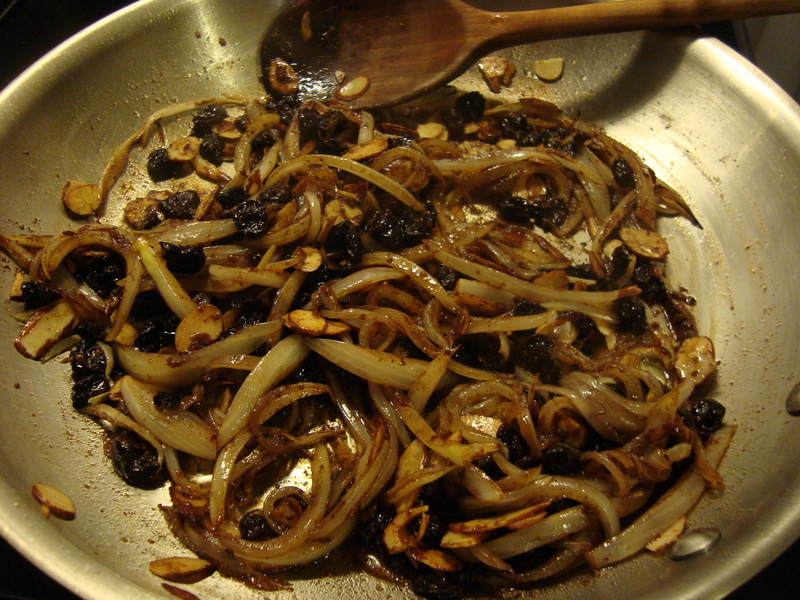 Stir in the almonds, cherries, sugar, cinnamon, ½ teaspoon salt, and a sprinkling of black pepper. Cook, stirring frequently, until the onions are deeply golden, about 15 minutes. Trim, rinse, and pat the breasts dry. Remove the tenderloin (the small hanging piece) and set aside. Using a sharp knife, cut into the breast about ½ inch from one end. Create a pocket, slicing to within about ¼ inch of the other side. Stuff each breast with about ½ cup of the filling, distributing it evenly throughout the pocket and to the ends. Press on the top of each breast to close the pocket. Line up 3 wide shallow dishes or bowls (pie plates are great for this). Fill the first with the flour. Lightly beat the eggs in the second dish. Toss the breadcrumbs in the third dish. Season the breasts generously on both sides with salt and pepper. 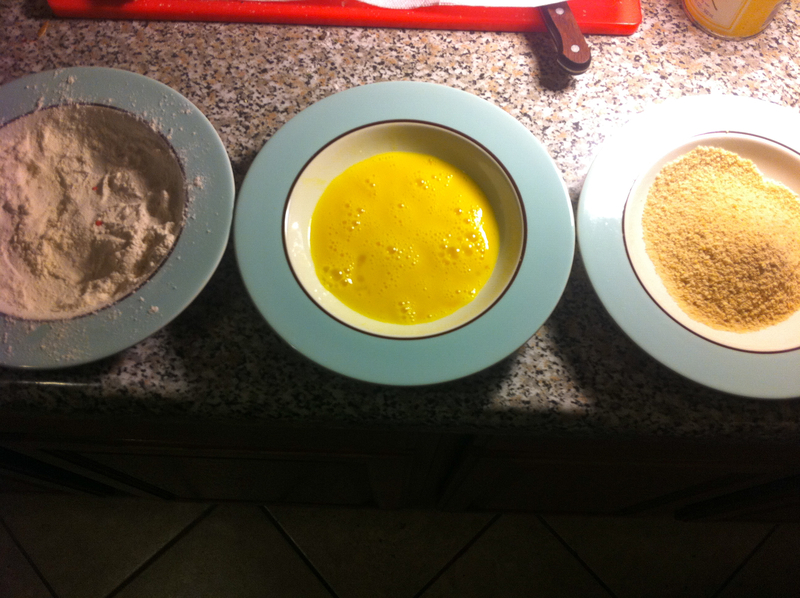 Dredge one breast well in the flour, shaking off any excess. Dip it into the eggs, turning to coat evenly, and then dredge it in the bread crumbs, pressing to make the crumbs adhere evenly. Gently shake off any excess. 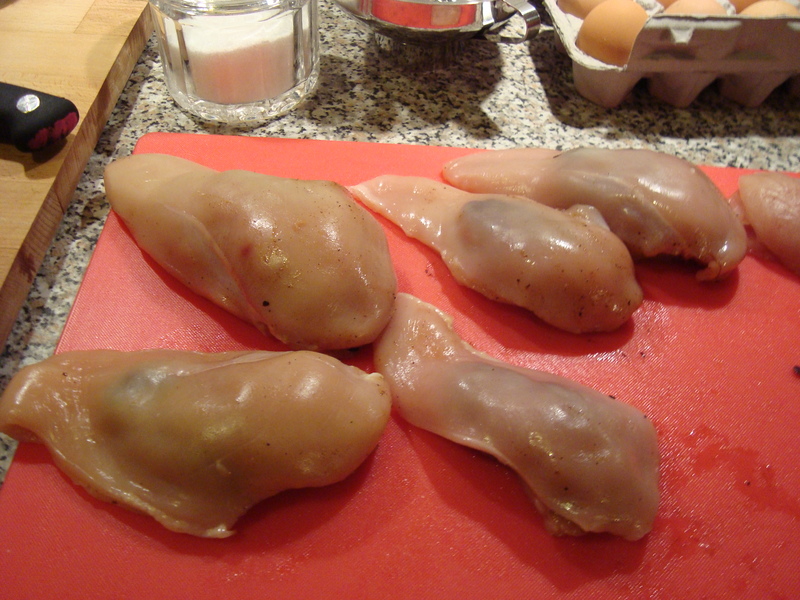 Set the breast on a plate and repeat with the remaining breasts. 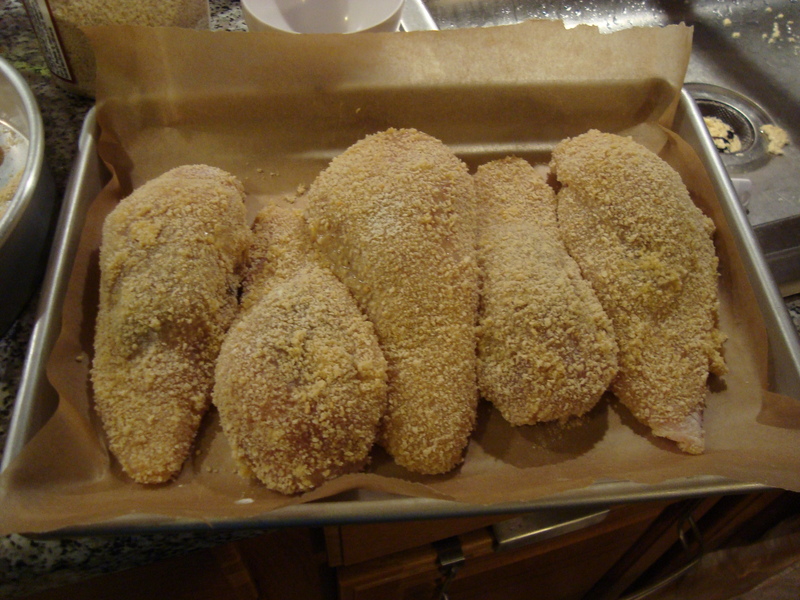 Refrigerate the breaded chicken for at least 5 minutes and up to 3 hours to let the coating set. Bread the tenderloins also. Discard leftover flour, egg, or breadcrumbs. Film a large nonstick skillet with oil and heat over medium-high heat. (I used organic olive oil spray. You can also use a pastry brush to spread a thin layer of oil over the pan.) When the oil is very hot (a hand held 1 inch over the pan should feel hot), carefully add 2 breasts to the pan (it should sizzle) and cook until golden brown, about 3 minutes per side. If the oil gets too hot, reduce the heat to medium. Transfer the breasts to a baking pan. Repeat with the other two breasts. Cook the tenderloins until brown and firm to the touch, about 3 minutes per side. Serve them along with the medallions or save them for a tasty snack. Place the baking pan in the oven and bake until the chicken feels firm to the touch (it will register 165ºF on an instant-read thermometer), about 15 minutes. Remove from the oven and slice into 1-inch thick medallions. Serve hot. Unfortunately, the lighting was not conducive to a great shot of it. Will reshoot. Kitchen Notes: You can place the cut medallions in a baking dish, cover, and refrigerate. Because of their filling, they stay moist, even when reheated. I tried sautéing the chicken breasts with a little more olive oil, and I did not like the results as much as with the method above. 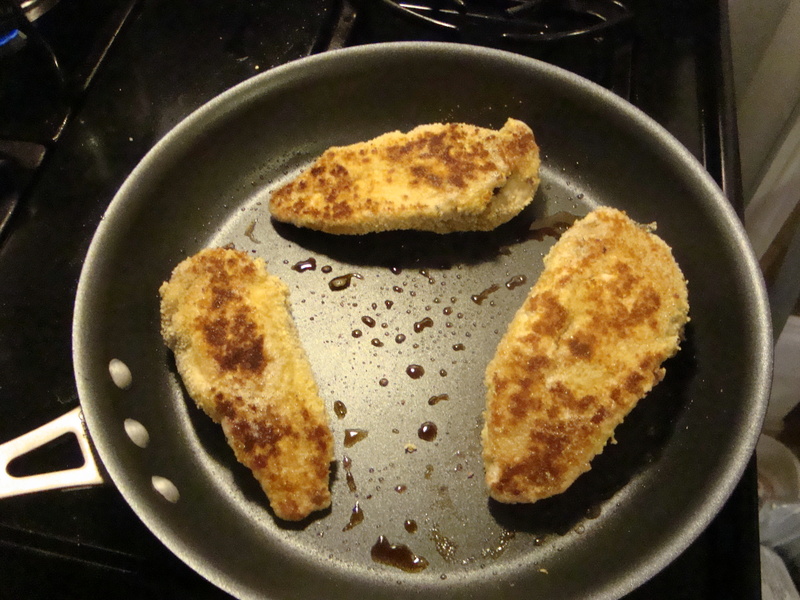 Although this method does not yield quite the same golden-brown finish as sautéing with a thicker layer of fat, it does produce a crispier cutlet, which I find much more satisfying to eat. 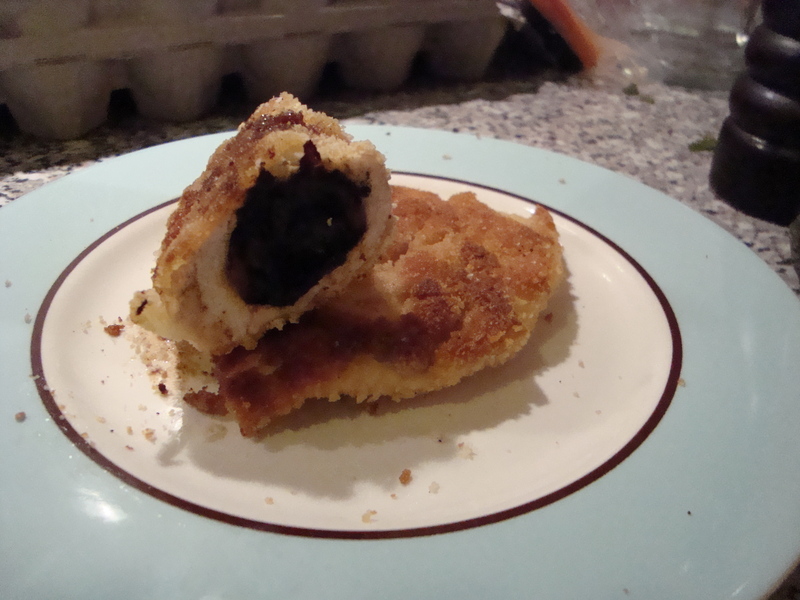 This entry was posted in Recipes and tagged almonds, breadcrumbs, cherries, chicken, cinnamon, dried fruit, Moroccan, Myra Kornfeld, onions, recipe, sucanat, white meat on May 11, 2011 by marinaberger.